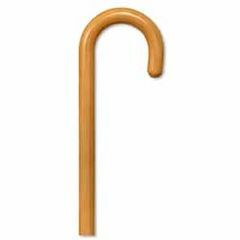 Wood Tourist Handle Cane Natural is a traditional walking cane. Can be used in either right or left hand. Height: approx 36-37" and has a weight capacity: 250 lbs. It was just what I expected. Lightweight. Well Constructed. Supports Weight. Easy To Use. I'm still getting used to the curved handle, but I'm sure I will find it very useful. It was easy to cut to size. Easy To Use. Stores Easily. Supports Weight. Lightweight. Safe. Long Distances. Wet Weather. Indoors. Outdoors. Easy To Use. Well Constructed. Safe. Lightweight. Supports Weight. Stores Easily. Short Distances. Outdoors. Indoors. Long Distances. Our dog was recently injured when attacked by another dog. At the advice of our veterinarian, I have sought a lightweight cane to use to separate animals in the event our dog is approached during our walks. The price for this cane was very attractive and I like natural wood canes, so I purchased this particular one. To my surprise, this cane was very solid, nicely finished, and very light for easy carry. I am 61 years old, so I find this cane to be a welcome companion to help steady myself while walking. In Texas, a cane is also useful to protect against any snakes or coyotes. The slender diameter, wood hardness, and being light weight, make this cane an excellent choice as an all-around cane for either male or female, though it may have to be sized to suit. I even enjoy twirling it! Some large discount hardware stores in our area will cut canes free of charge. I am very pleased with my purchase and would do the same, again. I would highly recommend this cane to anyone. I ordered two canes and both arrived promptly and in excellent condition. I have not used this cane in wet weather. For wet climate, snow, or ice, I would use an appropriate cane tip. Easy To Use. Stores Easily. Supports Weight. Safe. Well Constructed. The cane is a very sturdy cane with a nice finished wood look. Also has a very safe tip on it. Supports Weight. Well Constructed. Safe. You can easily cut it..
Not much you can say about a cane , but I am totally satisfied with it! If you don't know how to judge what size is right for you enter 'how to measure for cane height' on Google or Bing browser! Asked on Oct 4, 2011 9:01:35 PM by rvman from upper sandusky oh. Can this cane be cut shorter?